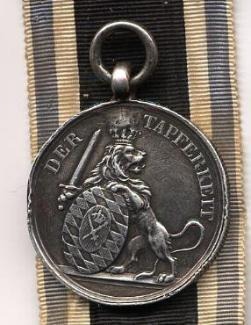 Unteroffizier Sebastian Herrling of the 6th company, 12th Bavarian Infantry Regiment was awarded the Bavarian silver bravery medal for killing/capturing the occupants of a shellhole during the 2nd Artois battle. 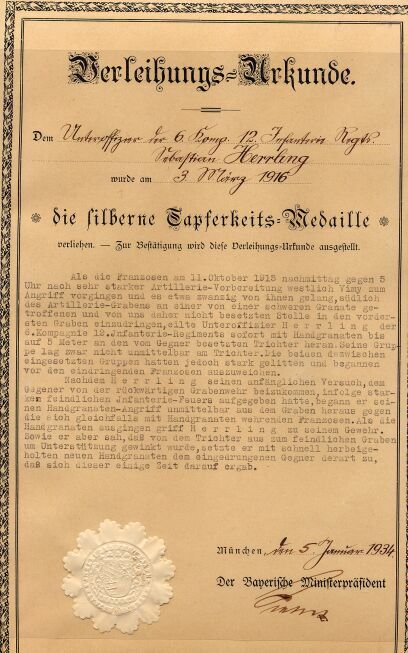 To the right is Herrling's silver bravery medal, at the end of the article is his formal award document. I hope this article puts his action into its historical context. The 2nd Artois is a battle about which little has been written. Douglas Porch says "The Battle of the Marne in 1914 and Verdun in 1916, both of which produced a profusion of accounts, seem to fit the stereotypes of glorious victory or heroic sacrifice better than what amounted to the pointless butchery of the Artois. Those who survived tended to keep silent about their experiences. It was a battle that, in military terms, achieved nothing-and yet produced unintended consequences. 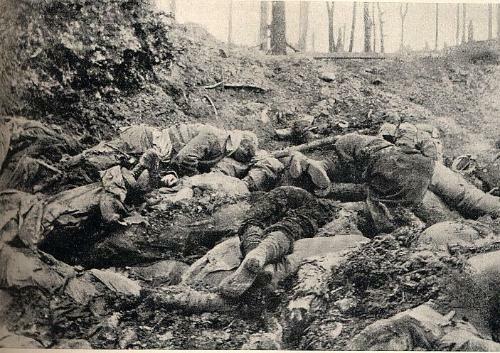 If nothing else, it must be counted as the prototypical trench slaughter of the great war." The French were to lose an estimated 150 000 men in the Autumn of 1915. The French army had taken over most offensive operations as the British needed time to restructure and train their new Army. In late September the Allies launched three offensives, known as the Battles of Champagne, Second Artois and Loos, the latter being a British "affair". For the Germans the Artois battle was known as the "Autumn Battle at la Bassee and Arras"
The 2. bayerische Division had moved from their positions to the west of Peronne to take up position to the west of Vimy on the 7th of October. The 12. bay. Infanterie Regiment was to the Northeast of Neuville in the Prinz Reuss Stellung. They had missed the main part of the battle, the slaughter of late September, but were in position to face the next French attack. From the 7th to the 10th of October they were under heavy artillery and Minenwerfer fire. In some sectors the French infantry were only 30m away and as a result the men in the front line were also under rifle grenade fire. Life in the front line consisted of waiting for the enemy attack, praying that no shell would land on you... and when it got dark, trying to rebuild some of the defensive positions. The 6. Komp would have been in position in the front line on the level of the Artilleriegraben. The attack was from West to East on the map below. "At 3 pm a group of French soldiers appear in front of the Elsterweg behind a smokescreen. They advance but the attack is broken up under our fire. At 6 pm the enemy has concentrated his fire on our position at la Folie and fires a salvo into his own trenches to get his infantry moving. On the II. Batln. positions gas grenades explode and opposite the 7. Komp the enemy starts to climb out of his trench. Our men are already in positions and shoot them down as the clamber out. Opposite the 8. Komp. the bayonets and helmets can be seen in the front line but Zügführer Mayerlen calls in artillery fire and the planned attack is not launched. At 6.30 pm the fire dies down although the heavy calibers continue. The positions have suffered badly, the carefully dug positions have collapsed. Every man realised what awaited us the next day and they worked tirelessly to prepare the positions. On the morning of the 11th of October the enemy artillery fire gets heavier and heavier. The large shells come howling over, including 28cm mines. The French have cleared away their defensive barriers, they are going to attack. Our sentries lie tensely behind their steel shields while fountains or earth, mud and smoke go up around them. In the trenches the soldiers are constantly digging out their comrades as the trenches collapse. They try and redig the trenches during the barrage but it is useless. In front of the 6. Komp a 28 cm mine blows a large hole in the trench and this makes movement impossible. The enemy is just 20 meters away and shoot down anyone trying to move along the trench.. Still the attack does not come. At 1 pm the 5. Komp. sees bayonet points in the opposing trenches but the Frenchmen are just removing a sandbag barrier. At 5 pm the French fire moves backwards to the La Folie farm. The moment of relief has come and the men man the firestep. In front of the 5. Komp about 80 Frenchmen are advancing. The few Poilu that are not killed or wounded scramble back to their trench." All along the II. Batln. line the attackers are mown down with accurate rifle and machine gun fire and the French attack crumbles. In a number of places the French occupy shellcraters, a few brave German soldiers were decorated for clearing out these pockets on the 11th of October. "The French attacked at 17:00 on the 11th of October 1915 to the West of Vimy. After an extremely heavy artillery bombardment twenty French soldiers occupied a crater from a heavy shell that had torn a hole in the German front line to the South of the Artillery trench. 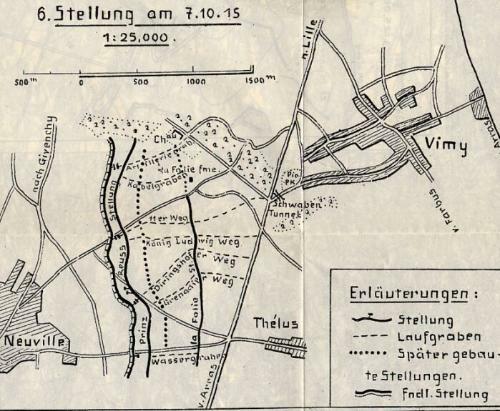 Acting independently of his own section Unteroffizier Herrling rushed forward with hand grenades to within 5m of the occupied shellhole while the neighbouring sections which had suffered heavy losses during the artillery preperation began to waver in the face of the attack. Heavy infantry fire caused Herrling to break off a flanking attempt and he instead attacked directly from the trench exchanging hand grenades with the Frenchmen until his supply of bombs ran out. He then began to use his rifle until he saw the French in the crater signalling to their front line for reinforcements. Hastily collecting some more grenades he attacked the shell hole with such fury that the shattered occupants surrendered soon after." The action as described in the citation is dramatic but the reality was probably even more so. After the terrible bombardment an adrenaline charged Herrling must have been a fear evoking sight indeed. The suffering of the Poilus must have been immense as the grenades detonated within the confines of the shell hole, the blast and splinters having a more or less captive audience. Had they not stayed put and had they done a leap forward they would probably have succeeded in overpowering and probably killing Herrling. As it is, luck was on Herrlings side that day. 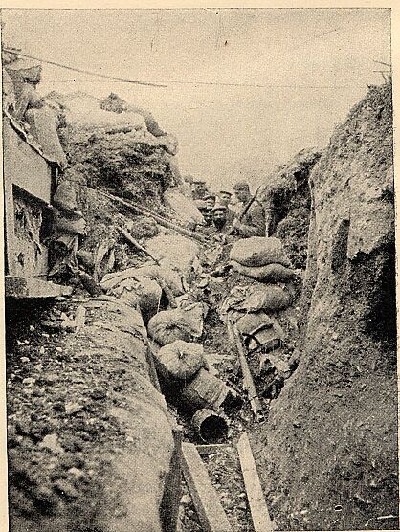 The condition of the Battalion's trenches after the bombardment. A breach in the sandbagged wall is to be seen.